Coarsely chop the cauliflower and toss with a drizzle of olive oil and the garlic. Roast at 375°F for about 15 minutes or until golden brown. 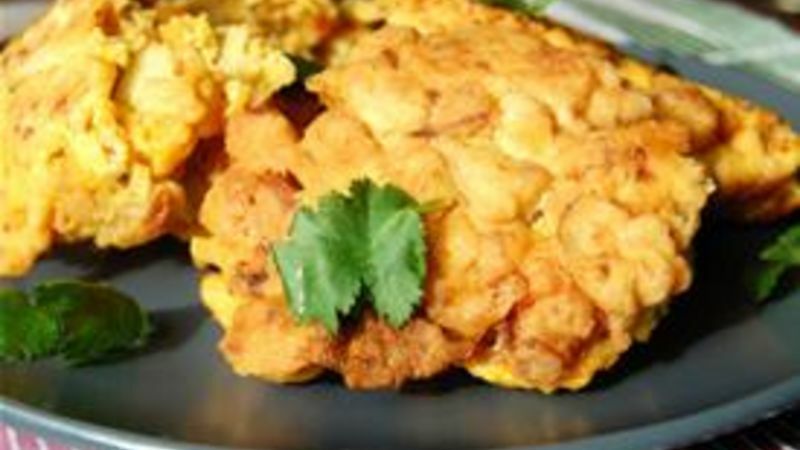 Combine the cauliflower with the remaining fritter ingredients, adding enough water to make a batter (should be thick enough to drop spoonfuls into hot oil). Heat the oil in a frying pan over medium heat. Drop spoonfuls of batter into the hot oil and fry until golden brown, flipping halfway. Transfer finished fritters to a plate lined with paper towels or cooling rack positioned over a cookie sheet, and stash them in a warm oven while cooking remaining fritters. Prepare raita by blending all ingredients except cucumber in a blender. Add salt and pepper to taste, then stir in the cucumber. Everyone wants the same thing this time of year: to tighten their belts, both literally and figuratively. We want to clean up our diets and get our budgets back in the black after all the holiday indulgence. Whenever I want to accomplish both of these tasks at once, there's no easier way than to go vegetarian. If you don’t practice a meat-free existence all year round, it can be a little daunting to make the switch. But fear not—I have a decade of vegetarianism under my belt, and I'm here to help! Any of these appetizers can easily make the transition from party platter to brown bag lunch, so making extra really pays off. 1. Cauliflower-Chickpea Fritters with Cilantro Raita. These pakora-like Cauliflower-Chickpea fritters are so light and delicious you may not even mind dirtying up your kitchen with the frying, though you could probably bake them. To make a batter, I combine flour, a little crushed tomatoes for moisture, a sprinkle of baking powder and soda, an egg and a little water. I added chopped roasted cauliflower florets, freshly-grated turmeric (you can use powdered) and a handful of cooked chickpeas. Make the raita by blending plain yogurt, a handful of cilantro, lime juice and salt and pepper. So easy, and makes a nice dinner with rice and naan or roti. 2. Japanese Rice Balls (Onigiri). Japanese Rice Balls are basically the PB&J of Japan. Cook up a pot of sushi rice and season with rice vinegar, mirin and a few pinches of salt. Scoop a ball with wet hands, and form a little pocket in the middle to stuff in a bit of teriyaki tofu, a blob of miso, or some chopped Japanese pickles. Then cap the filling with more rice, form into a rounded triangle and slap a little strip of nori on to keep your hands from getting messy when grabbing one. If you're packing these for lunch, wrap them in plastic wrap to keep them from drying out. There's nothing more impressive than tiny crepe purses stuffed with lovely fillings—sweet or savory—and tied with a little chive string. Just make a bunch of the thinnest crepes possible, and fill them with a spoonful of anything you fancy: fig jam, goat cheese and chopped rosemary; sautéed spinach and toasted pine nuts; butternut squash with pecans and gorgonzola crumbles; the sky's the limit. There are even some vegan crepe recipes floating around, and I bet plenty of them aren't half bad. Then fold them up like tiny burritos or gather them up like coin purses and tie them closed with a chive (wilt in warm water first to make them pliable). 4. Sweet Potato-Caramelized Onion Taquitos with Smoky Mole. These easy Sweet Potato-Camalized Onion Taquitos are filled with sweet potato and caramelized onions, seasoned with cumin and a pinch of cinnamon. . Just roll the filling up into corn tortillas, spritz lightly with cooking spray and bake until crispy. Serve with a quick mole of ancho chiles and chipotles (soak these in veggie broth until soft), pumpkin seeds and a square of dark chocolate, pureed until smooth. These Thai salad rolls are super easy, fast and cheap! Just pile softened rice papers with thinly-sliced teriyaki tofu, bean sprouts, cooked rice noodles, shredded carrots and lettuce. Add fresh mint and cilantro and roll them up! Serve with Thai sweet chile sauce or peanut sauce. Tightening the belt never tasted so good!